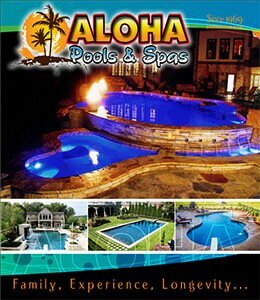 502-369-POOL (7665) or by emailing us. What Makes Aloha Your Best Choice? For almost fifty years and three generations, we’ve been designing, constructing – and, yes – even swimming in backyard pools. We believe everyone should have the option of a pool, and offer all the different types of inground pools to fit any budget. Vinyl, Fiberglass, Gunite — we do them all. With each new year, we work to improve quality and efficiency without sacrificing integrity. As a member of the Millennium Buying Group, we shop for the best prices and buy direct so you don’t have to. Volume purchasing has allowed us to remain competitive while others have come and gone, so you can be assured of great service beyond the sale. Need help visualizing your new pool? Ask about our computerized design services! We have designers that utilize 3D design software to help you visualize the backyard of your dreams, before construction ever begins. Contact us today for more information.